[Pete Juliano, N6QW] built a 20 M QRP CW transmitter using just a handful of parts. That in itself will not raise any eyebrows, until you find that he built it using one of the very first RF transistors manufactured all the way back in 1955. That’s from before the time most of us were born and not many years after the invention of the transistor in late 1947. QRP in HAM-speak technically stands for a request to “reduce power” or an offer of “should I reduce power” when appended with a question mark. A QRP transmitter is designed to transmit at really low powers. The accepted upper power limit for QRP transmitters is 5 W, at least for modes like CW using FM or AM modulation. [Pete]’s interest was piqued when he read about a 10 mW 10 M QRP transmitter design in a vintage Radio magazine from the late ’50’s and decided to replicate it. We aren’t sure, but it appears he had a Philco SB-100 RF transistor lying around in his parts bin. The SB-100 was one of the first surface-barrier transistors and could output 10 mW at frequencies up to 30MHz. [Pete]’s rig was originally putting out 0.4 mW with a 3 V supply, and oscillating at 14.060 MHz in the 20 M band. The design appears to be a simple Colpitts oscillator with just a few parts assembled in dead-bug style on a piece of copper clad laminate. After adding an output transformer, he managed to increase the power output to about 25 mW. Check out [Pete N6QW] sending out a CQ shout out from his QRP transmitter in the video after the break. If this gets you interested in Amateur Radio, but you are mic-shy, then [Dan Maloney] has some options for you in Shut Up and Say Something: Amateur Radio Digital Modes. As if Windows Update wasn’t bad enough, one has to deal with a plethora of attention-hungry programs and utilities all begging for a continual stream of patches from the Internet. It’s exhausting, but unfortunately also par for the course. Many of these updates are to close security vulnerabilities that could otherwise expose your computer to undesirables. The Internet of Things will only expand the amount of hardware and software you need to keep updated and protected on a daily basis. Now, it’s your dishwasher that’s under attack. The Register reports that Jens Regel discovered the bug in a Miele dishwasher with a webserver. It’s a basic directory traversal attack that can net the intruder the shadow password file. Armed with this, it’s simple to take over the embedded Linux system and wreak havoc on your local network. It’s not particularly surprising – we’ve talked about IoT security and its pitfalls before. The problem is, a dishwasher is not a computer. Unlike Microsoft, or Google, or even the people behind VLC, Miele don’t have infrastructure in place to push out an update to dishwashers worldwide. This means that as it stands, your only real solutions are to either disconnect the dishwasher from your network, or lock it behind a highly restrictive firewall. Both are likely to impede functionality. Of course, as always, many will ask why a dishwasher needs to be connected to the Internet at all. Why indeed. Every year, nestled between a swine auction and beef auction at the fairgrounds in Goshen, Indiana, the world’s greatest 3D-printing meetup happens. The Midwest RepRap Festival draws the greatest minds in 3D printing from around the world, with teams flying in from Prague, Oxford, and Hong Kong. This year was bigger than any other year. Over 1,000 people ventured forth into the sticks to attend this awesome festival dedicated to DIY printers. What did we see this year? The PartDaddy, SeeMeCNC’s 18-foot-tall delta printer made an appearance. We saw a new extruder from E3D, and an announcement that Open Source filaments will soon be a reality. True color printing with a five filament CMYKW system is weird and cool. DIY resin printers using laser diodes and galvos are now a thing. An Easy Break Oven isn’t broken. Printers with an infinite build volume now exist, and it skirts around a MakerBot patent, too. There was more to see at MRRF than a single weekend would allow. [Jason Kridner] from BeagleBone was there talking about the latest in fancy single-chip Linux computers. Hackerspaces were there talking about their coolest builds and doing the calculations necessary to strap model rocket engines to 3D printed rockets. A few local colleges sent teams out to talk about their efforts to bring additive manufacturing to their programs. YouTube personalities were there. Check out the rest of the goodies we saw below. Next weekend is the Vintage Computer Festival East in Wall, New Jersey. We’re going, and you should be there too. The VCF East is the largest gathering of retrocomputing aficionados on the east coast. It’s three days of talks, exhibits, a flea market, and a pow-wow of the greatest minds buried under obsolete technology. No VCF is complete without a few talks, and this year is shaping up to be great. Keynotes will include [Bjarne Stroustrup], designer / implementor / inventor of C++. Computer historian [Bill Degnan] will give a review of 40 years of ‘appliance computers’, and [Tom Perera], Ph.D. will be giving a talk on the Enigma machine. The exhibits at VCF are always the star of the show, and this year is no different. Highlights include mechanical computers, the finest from Silicon Graphics, and a version of Unix published by Microsoft. The individual exhibits are always great; last year the world’s first digital camera made an appearance. If you’re in the area, this isn’t an event to miss. VCF is going down at InfoAge, a science center at the former Camp Evans — a military installation that is best described as, ‘DARPA before World War II’. 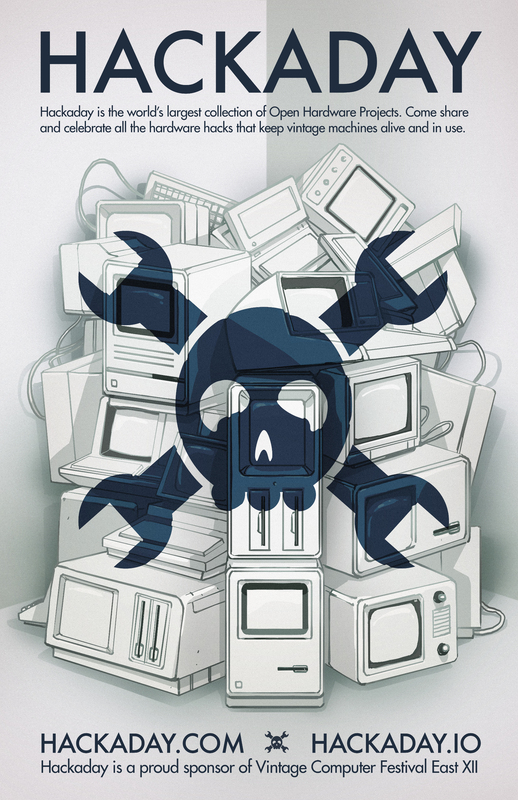 Hackaday is proud to once again sponsor VCF East. This has been going on for a couple of years now and our Art Director, [Joe Kim] has created some incredible art as part of the sponsorship. Click on the thumbnail of this year’s art to embiggen. The VCF West art from last year is a stunning take on the Macintosh and last year’s VCF East art reflected the retro hackathon we sponsored.